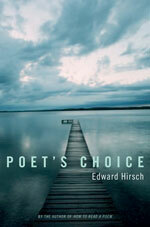 In Poet's Choice, Edward Hirsh (author of "How to Read a Poem") has again attempted to bring poetry to readers of popular books. And this is no small task, as it becomes necessary: 1) for casual readers to learn how to read poetry, and 2) for casual readers to even bother with poetry. To a poet, these words must sound incredible, but I have no idea how many writers out there are "on fire" for poetry in their hearts, but completely disheartened because only a few scholarly journals and the like seem to really show interest. To a bookseller, the same must be apparent, for the "poetry section" in almost any large bookstore is given but a few paltry shelves - sort of a token poet arrangement. Hirsch wisely solves this problem by starting with a brief and readable introduction followed by his carefully selected poetry, each introduced with a minimum of background and wisdom. For those readers who have too little time or patience, or perhaps too little appreciation for higher literary forms, here is a convenient package that can transport you into new adventures. I recommend that you at least give Edward Hirsch a try.